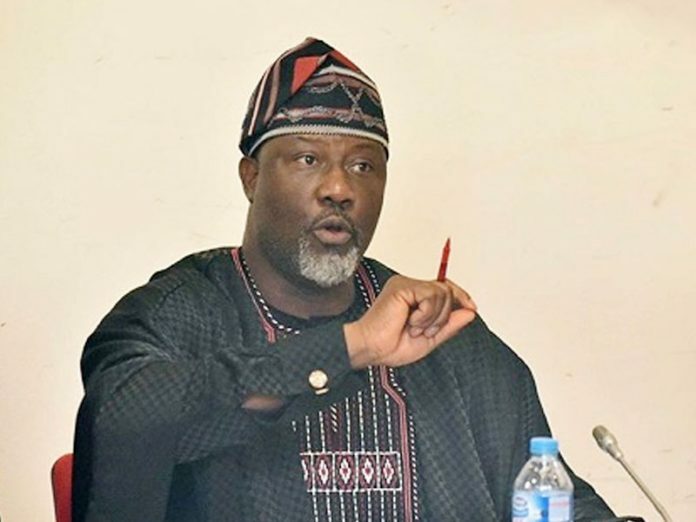 The senator representing Kogi West senatorial district in the National Assembly Dino Melaye seems to be wanted by the police in Abuja and his home state, Kogi. In Abuja, the senator, along with Ben Murray-Bruce is wanted over an alleged attack on policemen on 5 October, during a protest about the Osun election. He has not heeded the police invitation. On Friday, the Kogi State Police Command sent a detachment of officers to his country home in Aiyetoro-Gbede in Kogi State to effect his arrest, an incident that the senator has now distorted. According to the Kogi State Police Command, the senator is wanted in connection with a shooting incident on 19 July, when thugs suspected to be loyal to him attacked a policeman on a patrol. In a statement in Lokoja, the command said it took the action in connection with the July 19 shooting of one of its operatives, Sgt. Danjuma Salihu, by thugs suspected to be loyal to the senator. The statement signed by the command’s spokesman, DSP William Aya, said that the clarification followed the allegation by Melaye on his twitter page of October 12 that the ADC to Governor Yahaya Bello of Kogi led some officers to his house to assassinate him. “The ADC has nothing to do with this case. The command wishes to state unequivocally that the statement is not only a figment of the imagination of Senator Melaye who has mastered the art of political gimmickry, but totally false, malicious and highly mischievous. “The Commissioner of Police sent police officers to his country home for arrest, unfortunately we did not get him at home,” the statement said. It accused Melaye of mobilising thugs to attack its personnel on routine duty along Mopa-Aiyetoro-Gbede on July 19 without any provocation. “The thugs shot and injured Force No. 432913 Sgt. Danjuma Saliu who is currently receiving treatment at Veda Crest Hospital, Abuja,” the statement said. Aya said Melaye was invited officially through letter No. AR:3000/KGS/X/VOL.43/670 dated 23/7/2018 to come and answer the charges on him but refused to show up or give reason for not honouring the invitation. “The senator is wanted by the Kogi State Police Command for criminal conspiracy, attempted culpable homicide and unlawful possession of firearms,” the statement explained.